If you’ve never traveled overseas, or rarely have, you may be planning a trip with no idea what to pack. Packing for any trip is a skill that is learned through practice, and if you’ve had little practice, then you’ve had little room to perfect what works best for you. When you travel on international flights, the way you pack changes because what you will need on hand for extended periods of time changes. 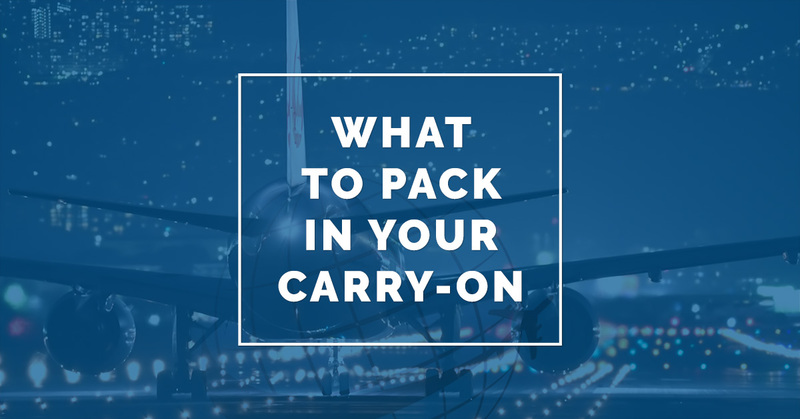 When you’re getting ready for your trip to Israel, or any overseas trip, take care when you pack your carry-on. Here at World Express Travel, we want to help you make sure you’re ready for your trip abroad. Don’t forget the following items for your carry-on when you pack for your trip to Israel. If you forget everything else, these are the three items you absolutely do not want to forget in your carry-on. If your checked luggage gets lost or you misplace your water bottle, you can get through just about anything as long as you have your passport, your wallet, and your itinerary printed out. Before you pack your passport at home, make sure to make a copy, just in case something happens. That way you can speak with an American embassy to get the theft or disappearance rectified. These three things can get you across borders and on your way to enjoy your trip no matter what happens. Whenever you fly overseas, you’re looking at anywhere from six to 14 hours sitting on a plane, if not more. This can be both tiring and uncomfortable at times, but if you pack a spare change of clothes in your carry-on, you can help make the trip much more comfortable. If you start to get sweaty from a full flight or have found yourself in the same change of clothes for an extended period of time, grab your spares and head for the bathroom. Changing clothes can quickly help you feel refreshed. And if your bag happens to miss a flight, you have a spare pair of clothes easily on hand. For the same reason you want to bring a change of clothes, you’ll probably want to bring your toothbrush in your carry-on. If you’re feeling a little worn down from travel, a quick change of clothes, a teeth cleaning, and even a fresh coat of deoderant can help you to feel refreshed and ready to go after a long plane ride. You don’t want to miss a minute of your trip, and coming prepared to jump right in can really help you make the most of your time at your destination. Time zones are often difficult to travel through. One of the best ways for you to be able to adjust to a new time zone is to get on the new schedule immediately. You can even start the process while you’re traveling. Book an overnight flight and plan on catching some Zzzs. To make the process easier, you’ll probably want to bring a traveling neck pillow and a warm jacket or hoodie. This will make it much easier to get comfortable so you can get the sleep that you need before you land. Most flights these days have in-flight entertainment options, especially for heading overseas. But no matter what, you’ll want to bring a little entertainment for yourself. Whether you grab your iPad which is loaded with games and movies, or you prefer your Kindle because you can travel with hundreds of books, make sure to pick your favorite and toss it in your carry-on for the long flight ahead. If we had to pick one other thing you don’t want to forget to pack in your carry-on besides your passport, it would be your medications. If you take medications that you have to take every day or at specific times, you’ll want to have easy access to them when you’re on the plane. It’s also not worth the risk to pack them in your checked luggage because acquiring lost prescription medicines overseas is exceptionally difficult. Take care of yourself by making sure to take care of your medication needs. While you can probably live between in-flight meals, if you’re anything like us, you like to have a familiar snack available for when your stomach starts to rumble. Packing a small variety of in-flight snacks will help you to not only get through any unfavorable in-flight meal, but they will also help you to have something else to focus on when the flight seems to get long. Grab granola bars, snack packs of crackers, or dried fruit to keep on you for when you need a quick bite. Much like with your passport and wallet, any valuables you travel with should be in your carry-on. Yes, TSA is supposed to be careful with your luggage, but you don’t want to risk losing your favorite pair of earrings or that charm bracelet your kids gave you because you decided to bring it along for a nice night out. Ideally, you will want to limit the valuables that you travel with to virtually nil, but we know that sometimes, there are just the few items that you want to bring. Keep them safely stowed in your carry-on for added assurance. If you’re ready to jump into the culture and adventure once you arrive in Israel, one completely optional item you may want to pack in your carry-on bag if you’re female is a scarf or shawl. A variety of women across the country wear head shawls, also known as Tichels, for religious or cultural reasons. These fashionable scarves can help you blend in and contain your hair if it’s a windy day. However, unlike other countries where a head scarf can be required of women, in Israel, it’s purely by choice. When you choose to travel to Israel through World Express Travel, you’ll be traveling with experienced and intelligent tour guides who know not only Israel, but how to travel around Israel seamlessly. Contact World Express Travel today to learn more about our travel agency services and how we can help you with your trip!